380EXis coupledto a Type-Acamera(see below). The featuresavailablewith Speedlite380EX differ dependingon the camera it is used with. Referto the table belowto checkyour cameratype.
. TTL auto flash controloperatesinstead.
.* Availableonlywiththe EOS-1N,EOS-1NRS, EOS A2|A2E. the meteringand flashexposureto the focusingpoinl;. lightand flashexposurecontrolfor both fill flashand low-lightconditions. The flash head can tilt upward up to 90" to bouncethe flash. buttonor the Speedlite'stest firing button. 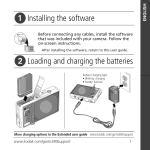 tip for usingthe Speedlite380EXand takingpictures.
. lf you have a Type-Acamera,read pages2-28 and 36-46.
. lf you have a Type-Bcamera,read pages 2-16 and 29-46.
turn on the cameraand Speedlite. When replacingbatteries, replace all four batteriesat one time. one set warm in a pocket, etc., and use the batteriesalternately.
. Speedlite380EX cannot be used with an externalpower source.
' The abovefiguresare basedon Canon'sStandardTest Methodwith a new set of batteries. it as shownby the arrow. O :To turn off the power. Use this switch to set highspeed sync. When a Type-B camera is used, normalsync mode is set regardlessof this switch'ssetting. closerto the subjectand try again. No." on page 44 to see how the Guide No. changes.
. lf a lens wider than 24mm is used, the light will falloffat the picture'speriphery.
. Usingany lens longerthan 100mmlightsthe 105 flashcoverageindicator. AF-assistbeam is effectivefrom 0.7 to 10 meters(2.3to 33 feet). th e s a meti m e .
both th e su bjec t and back g ro u n di n fi l l -fl a s ho r l o w -l i ghtcondi ti ons. combined.FP flash and FE lock can also be easilyset. and f ill- f las chon d i ti o n s .
o r F u l lA u t o( E ) . s w i tc h .
viewfinderand on the LCD panel. calculatethe output of the main flash for a correctflash exposure.
. The main flash is fired when the shutteris released. subject and background.This is called auto flash output reduciion. (manuai;.Set the FP flashswitchto the greendot (normalsync). displayedas in any AE mode.
. Manuallyset: Set by the user. Automaticallyset: Set by the camera.
. llX sec. :Camera'smaximumsync speed (see page 46). preflashis used to calculatethe optimumoutputof the main flash. I The exposurefor the backgroundis set with the shutterspeed and apeilure. flash in the ProgramAE mode. lf the maximum sync speed blinks,the backgroundwill be overexposed.lf the 30"
settinguntil the sync speed stops blinkingand stays on. set to the greendot (normalsync). p i c tu re . with a Type-Acamera,speedlite380EXenablesFp frashand FE lock. lf a largeapertureis to be used,set the camerato the Tv, Av, or M mode. Speedlite's flash range decreases with FP flash. distancex correctaperturevalue = Guide No. mode (P, Tv, Av, M, or DEP). Using FE lock may not make any differencefor a small subject. necessary, then take the picture..
the shutterbutton halfway,FE lock links to the selectedfocusingpoint. pressingthe shutterbutton,FE lock links to the center focusingpoint. or M mode and use a slow shutterspeed. f o r l o w - l r g hatn d f i l l - f l a scho n d i t i o n s .
viewfinderand on the LCD panei. subjectand background.This is called auto flash output reduction. set: Set by the camera. when the correctexposureis attained)accordingto the set aperture. I The exposurefor the backgroundis set withthe shutterspeedand aperture. usingit in the ProgramAE mode. lf the maximumsync speed blinks,the backgroundwill be overexposed.lf the 30"
settinguntilthe sync speed stopsblinkingand stayson. to the apertureset automaticallyby the camera. Taken with a normalsync speed. Takenwith a slow sync speed. 1. Set the camerato Av and set the aperture. 3. Checkthat nothingis blinkingin the vieMinderand take the picture. exposureis automaticallycontrolledby the TTL auto flash system. 1. Set the camerato Tv. 3. Set the shutterspeed so that a correctexposure*will be obtained. 4. Checkthat nothingis blinkingin the viewfinderand take the picture. 1. Set the camerato M.
2. Focusthe subjectand composethe shot. 4. Checkthe informationin the viewfinderand take the picture. Use a slowershutterspeed untilthe aperturevalue stops blinking. can reduceor eliminatethe shadowand producea softerlight.
. T h e f l a s hh e a dh a s c l i c ks t o p sa t 0 ' , o o ", 7 s " , a n d 9 0 " a n g l e sf o r t i l t i n g .
T a ke n w i th b o u n ce d fl a s h.
Taken with dir ec t fl as h.
patternedor not white, the resultwill be affectedaccordingly. as givingthe portraitsubjecta more naturaland sculpturallook. can use the TTL auto flash systemfor easy and automaticflash exposure. batteries in TTL Hot shoe Adapter 3 have sufficient power. three ConnectingCord 300's (3 meters/ 1Ofteach). TTL Hot Shoe Adaoter3 or TTL Distributor. the TTL Hot Shoe Adapter3 to up to three Speedlitesvia ConnectingCords. u n d e re xp o se d .
dependingon the sync rangeis attained. Type-A cameras(with E-TTL auto flash control). (2) High-speedsync (FP flash);Type-A Camera. (2) E-TTL auto flash partialmeteringwith a test preflash(TypeA Camera). (3) TTL off-the-filmauto flash metering(with Type-B cameras). (1) Automaticflash output reductionfor fill flash. metersI 2.3 to 33ft (in total darkness). Power turns off automaticallyafter 90 sec. of non-use.
. The above figuresare based on Canon's StandardTest Methodwith a new set of batteries. EOS 1OO,EOS EI.AN,EOS 7OO,EOS RT, EOS.